This blog is about card making, scrapbooking and quilting. вторник, 4 января 2011 г. Around 400 settlements in Russia have been left without electricity as a result of the heavy snowfall. This is what the trees and bushes look like after the "ice rain" last Saturday. These are some more of the fabric cover journals I recently made. 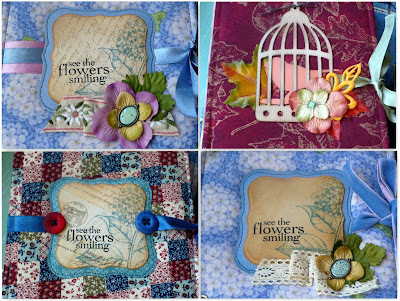 I enjoy combining quilting fabric, paper, stamping techniques, and scrapbook embelishments to create a unique journal. what is a "walking foot" for quilting on a sewing machine called in Russian? I really want to get one so I can finish some of my first quilt on my machine. But I'm not sure what it is called in Russian. When you're in Smolensk, I would love to meet with you! Happy New Year! and Merry Christmas! Thank you for playing to get give away. I hope you win. Бог благословил меня замечательным мужем, тремя сыновьями и дочерью. A blessed wife and a mother of three sons and a daughter. "Иисус же сказал ей в ответ: Марфа! Марфа! ты заботишься и суетишься о многом, а одно только нужно; Мария же избрала благую часть, которая не отнимется у неё" (Ев. от Луки 10:41-42).